Home / celeb / Gallery / half time / lady gaga / news / super bowl / the simpsons / videos / Lady Gaga and all the Super Bowl performances of the past 15 years! Lady Gaga and all the Super Bowl performances of the past 15 years! We all know that Lady Gaga is an amazing performer, but her powerful performance at the Super Bowl LI Halftime Show on Sunday was truly an unforgettable one. Even if the people of this region don't really keep track of the American National Football League matches, the performances at the final game always gets the world talking! But what surprised many even more is how “The Simpsons” had already predicted the diva’s performance at the Super Bowl five years ago with an episode titled “Lisa Goes Gaga”. In the episode, the Mother Monster is seen suspended in the air on wires while singing – just like the real Gaga at Super Bowl! 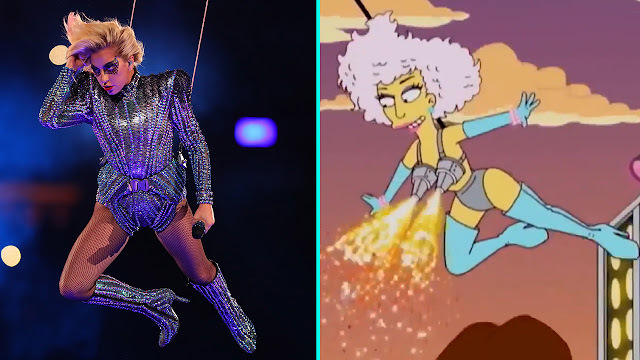 The two performances are not exactly the same, and there are a few differences, such as Gaga didn’t wear a fire-shooting bra like in the animation, but the metallic outfit and thigh-high blue boots are still quite spot on! This isn’t the first time “The Simpsons” predicted an event, back in 2000, they eerily predicted Trump presidency, and now people are starting to think that they are psychics! Anyway, let’s take a look back at all the previous Super Bowl halftime shows! Which one is your favourite?